Enjoy a fun, playful connection with your cosmic family! Connect in to the happy, playful, FUN energy of this Cosmic Family Picnic, and from that place make contact with your own cosmic family. It can remind you to not take things so seriously, to lighten up and have fun, and to create a contact experience that is joyful and light. 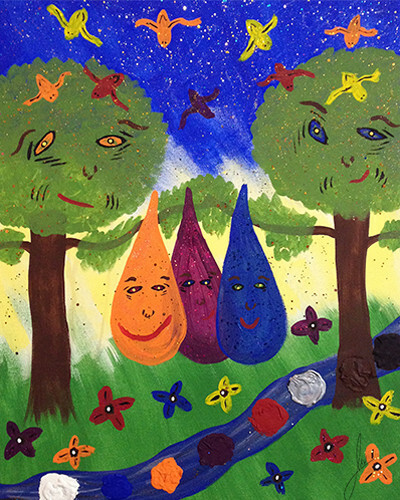 This is “Cosmic Family Picnic”, painted in April 2014. This painting was created as a “cosmic play date” with two of my hybrid children. Ethan and Mikhael are Yahyel-Earth human hybrids and were some of the first members of my cosmic family that I consciously connected with. While they are not physically present in my life, I connect to them telepathically, and we sometimes paint together in this way. I painted with the intention to connect and paint with them, and this painting was the result. Connecting in to the happy, playful, FUN energy of this painting can help shift you into that state yourself, and from that place make contact with your own cosmic family. It can remind you to not take things so seriously, to lighten up and have fun, and to create a contact experience that is joyful and light.